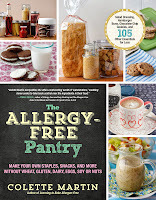 2014 was a great year for me with the release of my second book, The Allergy-Free Pantry. 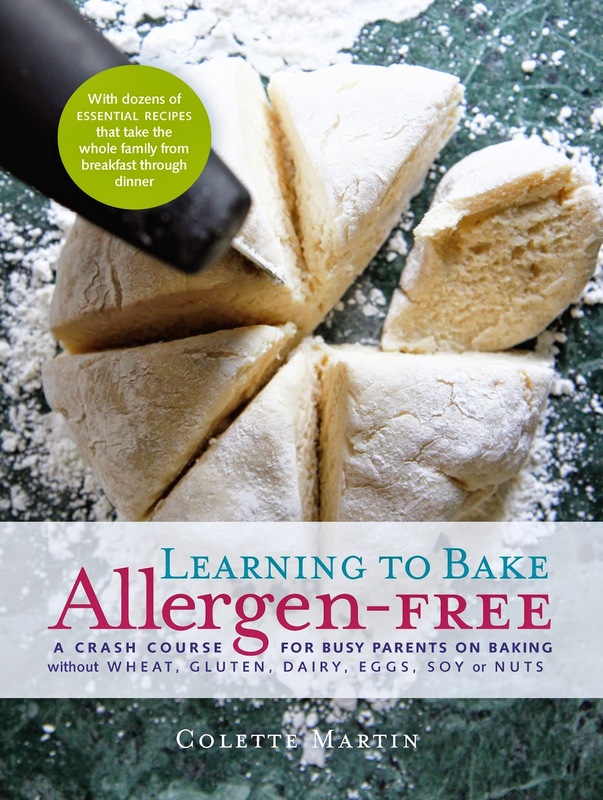 The book has been very well-received by the food allergy community and I am honored that you are reading it and making my recipes. Potato Salad - not just for summer picnics. Flaxseed Mayonnaise - If you try nothing else, you must try this! Powdered Doughnut Holes - A fave! Spinach Pasta - Save this one for a snow day. Strawberry Thumbprints - They freeze well, too! All of these recipes are gluten-free and top-8 allergen-free! Need some cookies to leave for Santa or Santa's little helpers? This great recipe from The Allergy-Free Pantry should do the trick! And there's no need to leave traditional milk for Santa. I know for certain that Santa loves hemp milk! Make these cookies with Strawberry Jam or another favorite jam. Ask the kids to help; a child’s thumb is just the right size to make thumbprints. 1. Combine the flours, xanthan gum, baking powder, and salt in a medium bowl. 2. In a separate large bowl, cream together the sugar and shortening using a mixer on medium speed for 5 minutes, scraping down the sides of the bowl as needed. The mixture will be light and fluffy. 3. Add the flaxseed egg and vanilla. Mix for 1 minute on medium speed. 4. Slowly add in the dry ingredients and blend on medium speed, about 2 minutes. The batter will be thick. Wrap the dough tightly in plastic and chill it for an hour. Cookie dough can be refrigerated for up to 2 weeks. 5. When you are ready to make cookies preheat the oven to 350°F (180°C). Line two large baking sheets with parchment paper. 6. Use your hands to shape the dough into balls, about 1¼ inches (3 cm) round. 7. Place the cookies on the baking sheet with space in between and flatten them just slightly. Use the tip of a finger, your thumb, or the back of a small spoon to create a small well in the center of each cookie. 8. Fill the center of each cookie with ¼ teaspoon of jam. 9. Bake each sheet of cookies separately in the center of the oven for 15 to 16 minutes, until the jam centers are sizzling and the edges of the cookies are golden. Let the cookies cool on the baking sheet for 5 minutes, then transfer them to a cooling rack. Store them in an airtight container at room temperature for up to 3 days. Baked cookies can be frozen in an airtight container for up to 3 months; thaw them at room temperature. Cookie dough (prepared through step 4) can be frozen for up to 6 months; thaw the dough in the refrigerator before forming cookies, filling with jam, and baking. 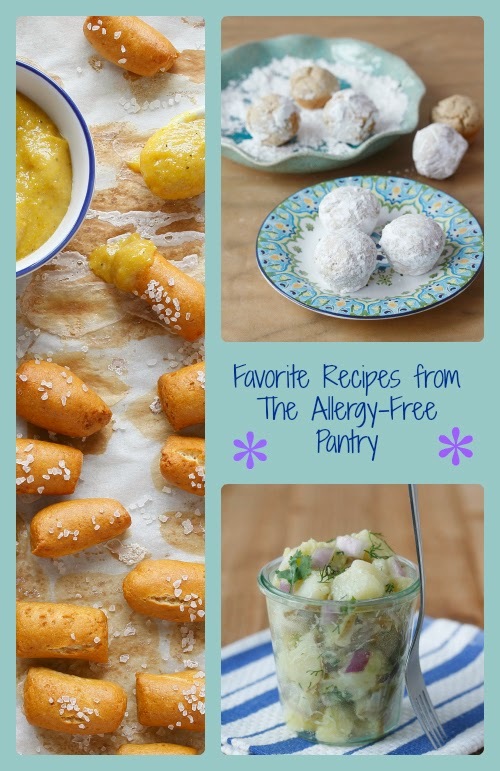 Credit line: Recipe from The Allergy-Free Pantry: Make Your Own Staples, Snacks, and More Without Wheat, Gluten, Dairy, Eggs, Soy or Nuts, copyright © Colette Martin, 2014. Reprinted by permission of the publisher, The Experiment. Available wherever books are sold. Who agrees that winter is the best time for pasta? It just might be the ultimate comfort food. If you are tired of the same brand of food-allergy-safe off-the-shelf pasta, try making your own. There is nothing quite like homemade pasta, and you can control the ingredients (including the flours used). The best tool I have found to make pasta is an attachment to my Kitchen Aid stand mixer. The KitchenAid KPEXTA Stand-Mixer Pasta-Extruder Attachment is what I use. Keep in mind that homemade pasta boils much faster than dried pasta from the grocery store. It only needs a couple of minutes. Trust me on that! 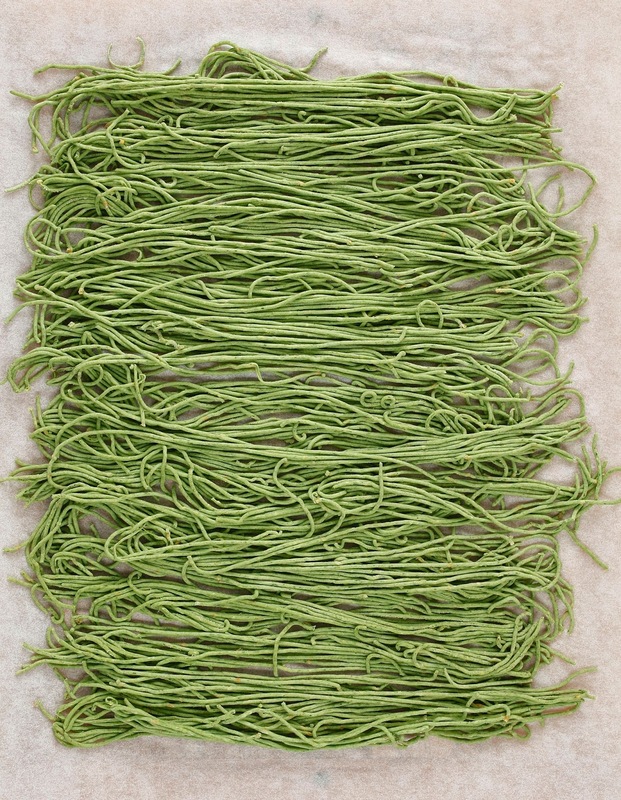 Here's my favorite homemade pasta recipe from The Allergy-Free Pantry . Pair it with any of the sauces found in the book. I'm partial to Marinara Sauce with Spinach Pasta. 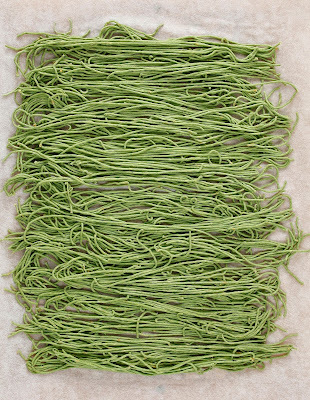 Spinach adds fiber and nutrients to plain pasta. Cook some extra spinach for dinner and save some to make pasta the next day. Use about 2 cups (60 g) of fresh spinach to make ¼ cup (45 g) of spinach puree (see note below). Serve it with Marinara Sauce for a colorful meal. 1. Puree the cooked spinach, flaxseed meal, and 2 tablespoons of the warm water in a food processor. Let it sit for 8 to 10 minutes. The mixture will be smooth and creamy. 2. Combine the flours, starch, xanthan gum, and ¼ teaspoon salt in a medium bowl and mix them together well. 3. Combine the spinach mixture and oil in a large bowl. 4. Add the dry ingredients to the wet ingredients and stir them together until crumbly. Test to see if the dough holds together by forming a small ball. Add up to 2 tablespoons of water as needed, 1 teaspoon at a time, until the mixture is stiff, yet smooth. The amount of water you need to add will vary based on how much moisture remains in the spinach. 5. Form tightly packed balls from the dough. 6. Use a pasta machine or extruder, following the directions for your tool, to form pasta in the desired shape, or form the pasta by hand. 7. Fill a pasta pot with water and 1 teaspoon of salt. Bring it to a rolling boil before adding the pasta. 8. Cook the pasta for 1 to 3 minutes. Drain, add sauce, and serve. Steam 2 cups (60 g) of fresh spinach leaves with 2 tablespoons of water in a medium saucepan over high heat for 2 to 3 minutes, until the leaves are tender. If using frozen spinach, prepare according to package directions. 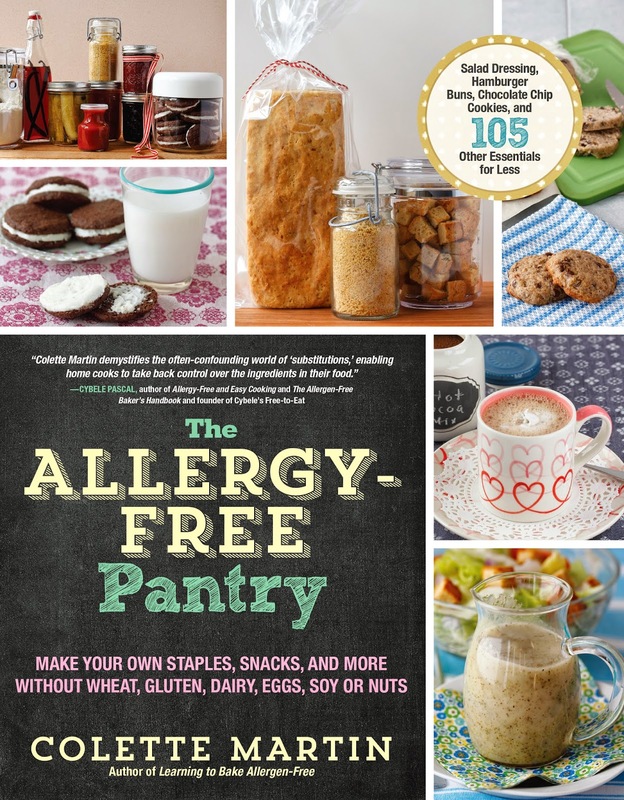 Recipe from The Allergy-Free Pantry: Make Your Own Staples, Snacks, and More Without Wheat, Gluten, Dairy, Eggs, Soy or Nuts, copyright © Colette Martin, 2014. Reprinted by permission of the publisher, The Experiment. Available wherever books are sold. It felt like Christmas came early when I opened a complimentary package from Udi’s Gluten Free and found a box full of goodies. 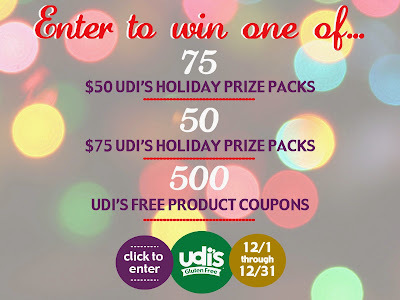 I must tell you a little about my personal history with Udi’s. While Udi’s breads (and most of their gluten-free goodies) are off-limits for my son due to his egg allergy, Udi’s whole grain bread has long been my choice for my own sandwiches. I am always thrilled to find Udi’s products at the restaurants I frequent, and on more than one occasion Udi’s has been my savior at a conference where they are sampling products (and the conference food line is lacking). 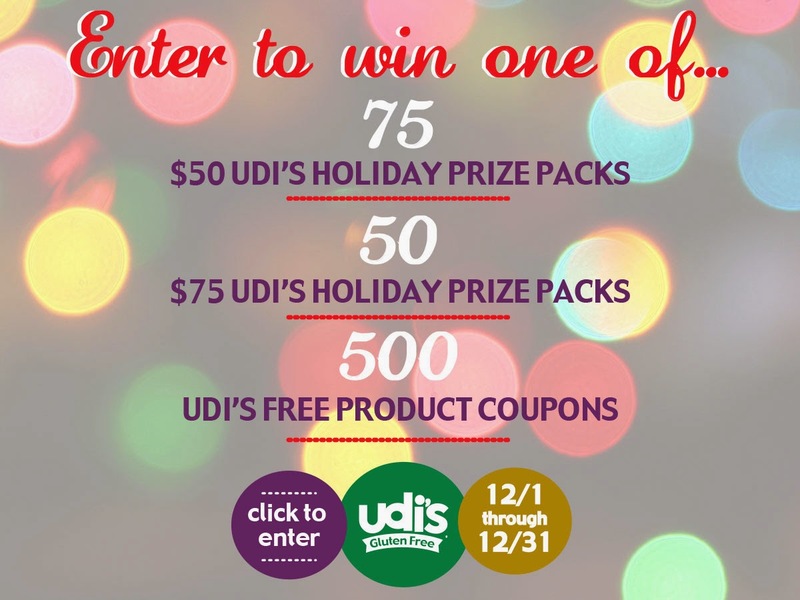 So yes, I love Udi’s. I hadn’t yet tried most of the products they shipped to me to review, and some are new. Gotta love that they are stepping up to meet the needs of our community! My first sampling was with a duo of muffins – one sweet, one savory (but still sweet enough). The muffins are gluten-free, dairy-free, soy-free, and nut-free (but do contain eggs). I was very excited to find burritos in my goodie box. Burritos, and more burritos. Burritos for breakfast, lunch, or dinner. Gluten-free burritos made with flour tortillas (happy dance!). The burritos contain milk and eggs. I think these burritos are perfect for a grab and go breakfast or lunch. One again, these are all gluten-free, dairy-free, and soy-free, but do contain eggs. Keep them in the freezer and take them out as needed for your gluten-free guests. Just remember not to serve them in the breadbasket with wheat rolls, and give your gluten-free guest a separate dipping dish. As an alternative, use the tortillas to make your own chips for dipping into hummus. Cut them into triangles, add spices (if desired) and bake in a single layer until crispy. Yes, we now have choices for gluten-free oatmeal. Hooray for that! But a great source for gluten-free steel cut oats has been elusive. I should note that this item is gluten-free, dairy-free, soy-free, and egg-free, but processed on a line that processes tree nuts. I think oatmeal with currants, flax and chia sounds like the perfect post-holiday detox breakfast, don’t you? As many of you know, I often use off-the-shelf gluten-free flour blends when baking. In addition to testing these flour blends for use in the recipes in my books, it’s almost a hobby of mine (okay, maybe an obsession) to search for the best gluten-free flour blends. In my experiments, I have discovered that there is tremendous variance between flour blends. Some work well for certain baked goods and perform poorly for others. Still others perform poorly most of the time. Few perform well across a spectrum of baked goods. 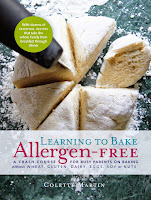 One of the flour blends I recommended in Learning to Bake Allergen-Free was Jules Gluten Free All Purpose Flour Blend. Since 2012, when the book was published, Jules Shepard, creator of that flour blend, left the company she founded. But she is back in a big way and I am thrilled, Jules’ new company (gfJules) now makes an even better version of that flour blend. The gfJules Gluten Free Flour is made in a top-8 allergen-free facility and the flour is non-GMO. Happy dance! The flour is shipped in a really clever box. I decided to test the gfJules flour with one of my favorite recipes from Learning to Bake Allergen-Free – Chocolate Croissants. But wait, I have more new products to talk about! At the Springfield GFAF Expo, I ran into the folks from Pascha Chocolate who were introducing their new chocolate chips. That’s right. Pascha now makes chocolate chips. Does it get any better than that? Yes, it does, the new top-8 allergen-free chocolate chips come in 55%, 85%, and 100% cacao. Not only do we now have another choice for food-allergy friendly chocolate chips, but the 100% is essentially baking chocolate – something very hard to find in a safe version. I am now singing while dancing! I decided to use the 85% in my Chocolate Croissants, because I’m that kind of girl. (Many of you may prefer the 55% for a less bitter taste.) I chose not to drizzle chocolate on top of my croissants because the rich taste of the chocolate inside was enough. The bottom line: I am thrilled with both of these products. gfJules Gluten Free flour performed flawlessly, and when paired with Pascha chocolate chips we have a winning combo! You can find the recipe for the chocolate croissants here.